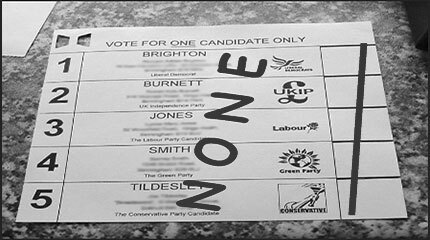 Vote or Vote NONE: there's no reason to be silent in the 2017 UK election. Why be silent in 2017? There's no reason to be silent. With the country so divided, it is more important than ever to show which politicians speak for you, or that none of them speak for you. But in the 2015 and 2010 general elections over a third of registered voters did not vote. Back in 2005 it was nearly as many as voted Labour and Conservative combined. Non-voters are silent and invisible. They are not shown in the results. Not voting is explained away as apathy. So it's time to be heard. Goal: If just some of the unheard third Vote for what they believe in, the results of the election can change. See the Real Results. Goal: If just some Vote NONE, then the protest for change can be the biggest ever public protest in UK history. It can establish the protest vote as part of UK politics. So even if you are fed up with UK politics… use your vote. 'I believe in democracy, but I do not support any of the candidates. I want better politics in the UK'. This website offers practical information on voting and protest votes, as well as argument, debate and results. 2015 results: 34% were silent. Why use your vote? Why Vote? Why Vote NONE? How does voting NONE work? This time, help to make sure that everyone realises they have the option to either Vote, or Vote NONE. Register now. It's your vote. © VoteNone.org.uk 2015-17. Please quote and link. The website is offered in good faith, with no guarantees and no liability accepted for its interpretation, use or any consequences thereof.